I’m not the biggest fan of pumpkin pie. I know it’s the traditional pie served for Thanksgiving. But I’m not and have never been a huge fan of pumpkin. There’s something about that residual squash-like flavor that throws me off in a dessert. However, I am a huuuuge fan of pumpkin spice flavor. Yes, I’m being ridiculous. But it is what it is. I’ll take pumpkin spice in my coffee, bread, cookies, anything but actual pumpkin pie… until this recipe. Tada! This Pecan Honeycomb Buttermilk Pumpkin Pie (say that five times fast!) is light, luscious and honestly the best pumpkin pie I’ve ever had. The tartness from the buttermilk masks the squash flavor and makes the filling super light. Then there is the honeycomb pecan crunch. 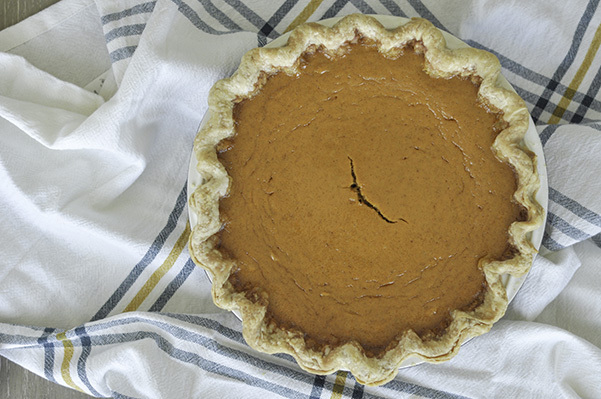 Since the pumpkin pie is smooth and creamy, I needed to add something crunchy to contrast that texture. This crispy pecan honeycomb is the perfect foil to the creamy pie. How can you not want to take a bite of this!? I made this pie a couple of times since September (I got really into pumpkin spice early this year!) and each time it just came out better and better. For the crust, I used my favorite Lard and Butter pie crust. This gives it both flakiness and flavor. Plus its a great crust for any pie so use it in your apple pie, pecan pie or peach pie in the summer. The uses for this dough is endless! My Favorite All Purpose Pie Crust! Once the pie crust has been blind baked, set it aside to cool and make the filling. It’s an easy mixture that comes together easily. It’s just a matter of whisking the all the filling ingredients together. The pumpkin, buttermilk, cream, butter, eggs and spices together. Yes this filling has cream in it!! Pour the luscious filling into the cooled crust and baked for about one and a half hours or until the filling is set. I baked this in both a disposable pie tin and a ceramic pie pan and the tin was perfectly set at an hour and a half, the pie dish took about another 10-15 minutes to set. Don’t worry about cracks here! While this is cooking I made the honeycomb candy. Oh my gosh, I’ve never had honeycomb candy till I moved here. I’ve seen it on tv and heard about it but never had a chance to try until we ate a a fantastic local restaurant here called Odd Duck. One of their desserts had honeycomb candy sprinkled on top and it was a revelation! Light, airy and crispy it was the perfect accompaniment for a creamy dessert….such as this Buttermilk Pumpkin Pie. This honeycomb recipe is from the Pioneer Woman (who’s going to mess with perfection!?) But I did sprinkle pecans and Maldon salt on top before the candy set. And let me tell you, it is good. Like can’t stop eating it and I might just eat this whole pan for lunch good! Once the candy is set, I whacked it with a mallet…DON’T whack it with a mallet. I crushed the airiness of the candy, instead whack its with the back of a large knife of break it apart with your hands. Store the pieces in an airtight container until you’re ready to serve! In a large bowl whisk together the pumpkin, milks, eggs, syrup, butter and spices until well combined and smooth. Pour into baked pie shell, and bake for 1 1/2 to 2 hours or until filling has set and skewer comes out clean. Transfer to a rack and let cool completely. Make the Honeycomb: In a heavy-bottomed saucepan, add sugar and give it a shake so it lays flat in the pan. Add corn syrup, honey, and water, so all of the sugar has been moistened, but do not stir. Turn the heat to medium high, and watch closely as the sugar starts to dissolve and the ingredients start to meld together. Cook the mixture to 300ºF, which should take about 5–10 minutes depending on the strength of your stove, then remove the pan from the heat. Quickly whisk in the baking soda for about 5 seconds, and once it has stopped foaming up, immediately pour the mixture onto the parchment paper. Sprinkle on pecans and sea salt. Let cool for 1 hour until hardened, then whack the honeycomb with a knife to break into pieces. Top the pie with the broken honeycomb pieces. 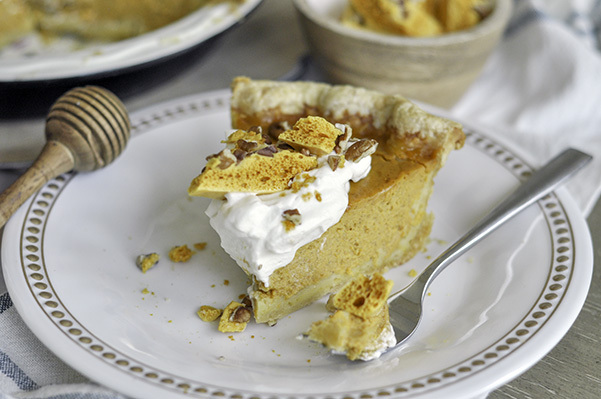 Top the cooled pie with fresh whipped cream (or bourbon whipped cream (add 2 tbsp of bourbon when you reach soft peaks) and sprinkle on as much honeycomb candy as you can!